St. Luke’s is well-known for hosting congregation and community dinners. Individuals within the congregation sponsor coffee hours after the 10:30 service, a wonderful opportunity to get acquainted with your fellow worshipers. Dinner Circles, an active Men’s Group and an equally active Women’s Group, called St. Luke’s Guild, meet socially and to undertake church projects. We invite you to take a closer look at our many hospitality ministries and welcome any questions you may have or inquiries on how to participate. St. Luke’s Welcoming/Involving Committee lives out our core value of hospitality. This group coordinates St. Luke’s Greeters, who play an important role greeting visitors and helping them feel comfortable in our worship. This group also organizes events throughout the year, such as the Dinner Circles and social hours to welcome new members. St. Luke’s Guild provides spiritual support, friendship, and social experiences to women of St. Luke’s. The Guild raises funds with its annual Snowflake Faire and assists St. Luke’s Men with fundraising efforts. The group meets monthly in the Parish Hall for lunch, Guild business and friendship. There is usually a speaker who talks about a topic current with the church. 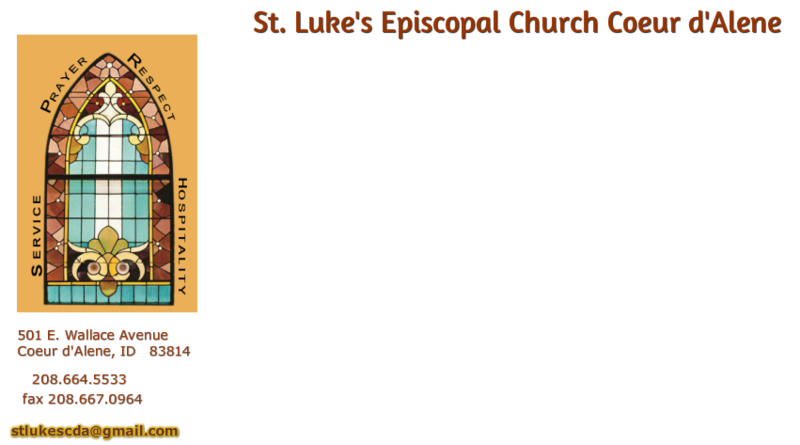 All women at St. Luke’s are invited to attend these meetings. St. Luke’s Men sponsors four meal fundraisers each year, raising money to support the church and the wider community. The dinners include, the Chili Feed, Shrove Tuesday Pancake Supper, “St. Lukangelos” Italian dinner and the Western Night Steak Dinner. The group also sponsors a fishing outing for children at St. Vincent’s Transitional Housing and sometimes provides breakfasts for Fresh Start. This group meets monthly for dinner, companionship, business, and often has a speaker. Members of St. Luke’s volunteer to bring refreshments and set up coffee to be served after the 10:30 service. Coffee Hour is a special time at St. Luke’s providing those attending service with the opportunity to meet others and relax for a friendly conversation. It is an excellent way for visitors to explore St. Luke’s as a possible church home. You’ll always find many who are happy to meet and get to know anyone visiting our parish. Dinner Circles are groups of 8 to 10 who get together for potluck at a member’s home once a month for three months. Dinner Circles help people in the congregation build new friendships, deepen old friendships, and simply have fun.